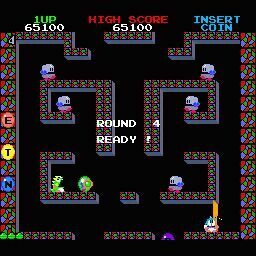 A cute platformer, starring Bub and Bob the dinosaurs, Bubble Bobble can be played either as a single player game or by two players on the same screen at once. The game was one of the first to allow co-operative play, as you play together to complete the 100 levels in the game to rescue your girlfriends. 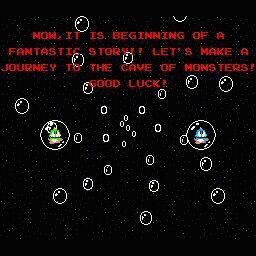 Your objective in each room is to clear the room of monsters to advance to the next stage. You can run along the platforms and jump to the level above and across small gaps. You can fall any height on screen without fear of injury and you kill your adversaries by encasing them in the bubbles you fire and then burst them. The monsters then turn into fruit which can be collected for bonus points. The more monsters you kill at once the more bonus points and higher scoring fruit you gain. After killing the last monster you only have a few seconds to collect the remaining fruit before you advance to the next stage. 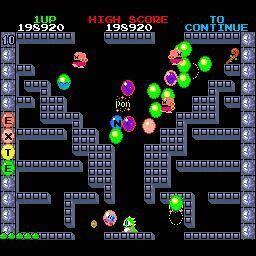 You can collect powerups to increase your abilities, which appear in the form of sweets which you run into. The increases you gain are Bubble Speed, Bubble distance, Bubble firing rate and your movement speed. These all last until you lose a life, when your abilities all revert to the game start settings. Each of the 100 stages in the game has a unique platform layout with different enemies to deal with The various enemies have different movement patterns which you have to learn to counter. Some are fairly basic and just wander along the platforms towards you whereas others will jump at you from platforms below or even roll rocks at you! On every stage there is a time limit though, and if you take too long the "Skel" appears, a white ghost-like figure who is indestructible. The Skel moves relentlessly towards you, even through platforms and walls, and can only be removed from the level by killing the last monster on screen to complete the stage. You can also collect letters of the word EXTEND when they appear. Spell EXTEND to clear the stage you are on and gain an extra life. Bomb - kills all monsters and turns them into diamonds. Book - bomb kills all monsters and turns them into diamonds. Cane - when the last enemy dies, every bubble on screen turns into fruit. Also a large fruit/diamond will fall from the top of the screen. Chalice - red gives you all the "sweets" powerups plus speed, blue awards points for running, purple kills all monsters on screen and turns them into diamonds. Chest - when the last enemy dies, diamonds fall down. Clock - stops the level timer so you don't get the "hurry up" message. Cross - blue fills the screen with water and kills all monsters which turn into diamonds, red allows you to shot fireballs instead of bubbles which turn monsters into diamonds, yellow makes lightning bolts hit the screen which kill monsters turning them into diamonds. Diamond necklace - a ball flies around the screen and turns the monsters into diamonds. Doorway - These appear if you can get to level 20, 30, and 40 without losing a man. You get a bonus room filled with 10,000 point diamonds. Getting to level 50 without dying advances you to level 70. Fire Bubble - burst this to make fire fall to the ground and kill monsters. Lightning Bubble - fires a bolt of lightning across the screen behind you. Loveheart - freeze all monsters - you can kill them on contact. Potion - fill the screen with various items - collect all of these for a 100,000 bonus. Ring - red awards 100 points for each bubble you fire, blue awards points for running, purple awards 500 points for each time you jump, silver makes stars fly around the screen which kill the monsters. Umbrella - blue advances three stages, yellow advances five and purple advances seven. You clear the stage you are on and jump forward to the new stage. EXTEND letters appear according to the number of monsters killed at once on the previous stage less two. 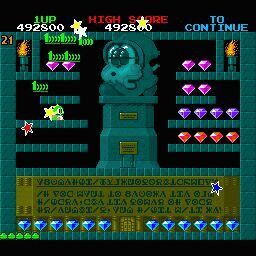 Example: kill 4 monsters on one stage at once to gain two EXTEND letters on the next stage. Note that EXTEND letters only appear on stages where the bottom of the screen is open from where they can float up. 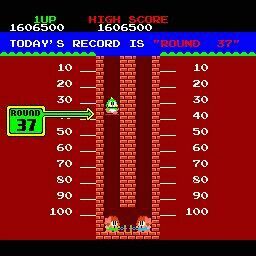 If the hundreds and tens digits of your score are the same when you kill the last monster, all bubbles on the screen turn into fruit. On the early stages, try to make sure you kill all the monsters on screen at the same time to maximise your score. You should aim for 100,000 points by stage 4.